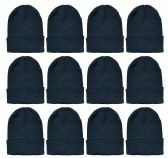 36 Units of Yacht And Smith Warm Winter Beanie Solid Black - Winter Beanie Hats at low wholesale prices. alltimetrading.com offers Winter Beanie Hats at bulk discounted prices. UNISEX BEANIES FOR COLD WEATHER: These winter hats fit both men and women. A comfortable and thick beanie help you to block out the wind and reduce the chance of catching a cold. CUFFED SKULL CAP: Cuffed skull cap is designed the way that you can extend it lower to cover your ears for additional warmth. BEANIES FOR COLD WEATHER: Comfort stretch beanie will provide added warmth by trapping heat underneath while preventing the wintry air from entering. The thicker beanies helps to insulate and keep the head warmer for longer. SKU: 2012865 Free same day shipping. SKU: 1287077 Free same day shipping. SKU: 1295414 Free same day shipping. SKU: 1313670 Free same day shipping.